Last week I took a risk that was scary: I pitched an article to Relevant Magazine. If you’re reading this blog, there’s a good chance you’ve read Relevant. If you haven’t, Relevant is a Christian magazine that looks to marry the church, the arts, and modern culture. Either way – Relevant is a huge deal to my generation. Getting a spot on their website would be gigantic for me. When you see something that isn’t how it should be, you can do two things. You can either criticize it or be part of the solution. For years I’ve written about this idea of “changing the world.” For many of you, it’s an idea that is too big to wrap your head around. How can you change the world when you have tests to study for, projects to pitch, and kids to take care of? It all starts with choosing which side you’re going to be on when you see something that isn’t how it should be. Or will you be part of the solution? For me, I want to be part of the solution. I want to be a part of a generation that no one can forget because we took the time to fix the world around us. When I’m 78 and look back at my life growing up, I want to be able to say that my friends and I didn’t look at the brokenness and let it stay broken. The way we do this is simple: we start with those closest to us. We can’t fix the giant problems without fixing the small ones first. Too often we let the bigness of “changing the world” keep us from attacking the little problem down the street. 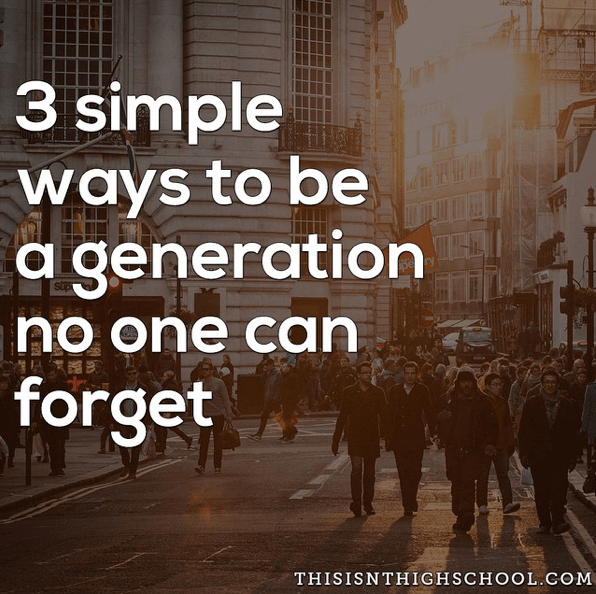 How do we become a generation that no one can forget? This is where it starts. It’s being nice to the customer service person on the phone. It’s thanking the teller at the bank. It’s holding a door for the little old lady at Cracker Barrel. We’ve become so busy as a society that what used to be common courtesy isn’t common at all anymore. You have no clue how much you can impact somebody when you’re nice to them for the sole reason that they’re another human being and they deserve it. We’ve become so busy that what used to be common courtesy isn’t common at all anymore. 2) Do something for someone. It doesn’t matter what it is. Take the time to do something for somebody with no strings attached. Show other people how they matter to you. This is actually one of my goals for this year. As a new business owner, I’m making it a point to keep time in my schedule each week so that I can simply do something for someone. I love the look on a person’s face when I go to them and say, “Hey. I’ve got some free time. What can I do to help you?” After the shock wears off, they usually appreciate that I took the time to offer more than what I did for them. People need to know how grateful we are for them. They need to know we appreciate any and everything they do for us. The truth is no one owes you anything. Everything anyone does for you – whether it’s a favor at work, a compliment at home, or an answer to a question – is a gift. Treat is as such. Be as thankful for the mundane as you are for the best Christmas present. Be as thankful for the mundane as you are for the best Christmas present. The world we live in is broken. What would happen if we became a generation known for being nice? Known for serving each other? I guarantee you no one would ever forget us. Loved your post and your practical ideas we can all implement. I have found by being nice to the cashier and actually asking how her day is I can see her smile authentically. To many, they are invisible. We can notice them because God sees us. It’s amazing how much people respond to the simplest of gestures.